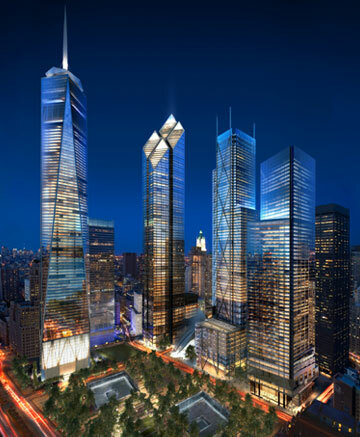 In September, 2006, Silverstein Properties unveiled the designs for the three skyscapers he is going to build at Ground Zero to the east of the Freedom Tower , and city and state officials and the Port Authority of New York & New Jersey at long last "finalized" their agreement on the redevelopment of the site. The flurry of announcements were spurred by the fifth anniversary of the terrorist attacks of September 11, 2001 (see The City Review article on the attack) that demolished the World Trade Center and 7 World Trade Center and severely damaged several other nearby buildings, including the Deutsche Bank tower on the south side of the site which is be demolished and replaced by another tower that will be erected by the Port Authority, which is also now the developer of the Freedom Tower. No design for the south tower has been released yet. The agreement that was "finalized" would seem to bring to an end a very contentious and controversial phase of the rebuilding of Ground Zero. The only element of the overall plans for Ground Zero that sailed through the city's turbulent process of civic review was a transportation center designed by Santiago Calatrava (see The City Review article on an recent exhibition of his work) that is intended to conjure a bird in flight. The design of the Freedom Tower has been very tortuous (see The City Review article on the first official round of designs, The City Review article on a competition sponsored by The New York Times, The City Review article on New York Magazine's competition for the site, The City Review article on the Lower Manhattan Development Corporation's selection of six finalists in the second official competition, The City Review article on the second official competition, The City Review article on the unveiling of the winning design for rebuilding Ground Zero, and The City Review article on David Child's design for the Freedom Tower. A major part of the rebuilding was to be a memorial in the center of the site and that has been one of the most controversial (see The City Review article). At this point, the design community and the public have been exasperated and exhausted and, with the exception of the many of the victims' families, prepared to see almost anything go into construction. Many of the victims' families have continued to argue that the grounds are sacred and nothing should be built except a memorial and they did not have a consensus on the memorial. The "finalization" of the agreements, which also came as the state and city and the Port Authority agreed to substantial office space leases in the project, would seem to mean that we finally have a specific, officially approved design that is not likely to be changed substantially. The agreements require that the Port Authority turn over "ready-to-go" sites to Silverstein Properties within a couple of years of face $300,000-a-day penalties and that Silverstein Properties complete all of its three towers with a few years, or lose control of them. 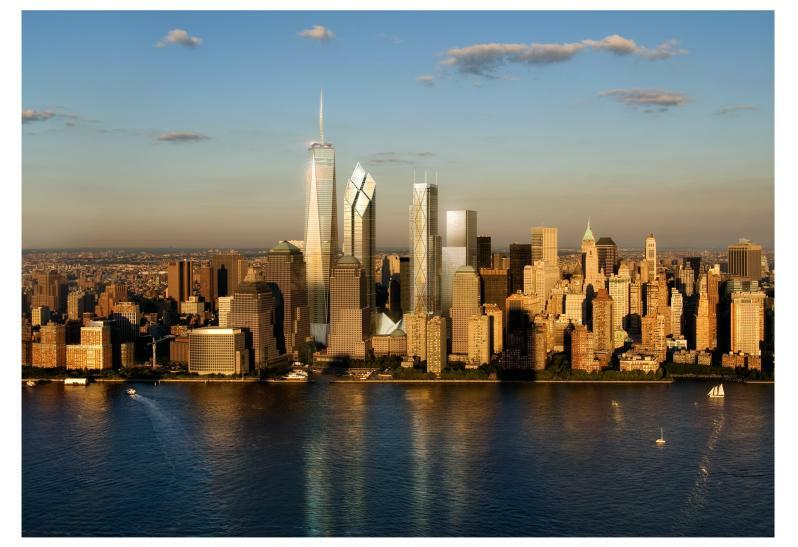 Apart from the Port Authority's design of the tower to replace the Deutsche Bank building, which is likely to be the last office tower erected, the only missing ingredient not yet published is Frank O. Gehry's design for the planned cultural center at the site. Frank O. Gehry (see The City Review article on a Gehry exhibition at the Solomon R. Guggenheim Museum and The City Review article on Gehry's design of a major mixed-use tower for Forest City Rattner a few blocks to the east of Ground Zero). 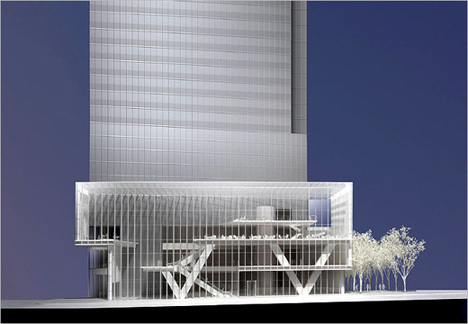 This cultural facility, which generated its own controversy over which institutions would be included, will be located just to the east of the Freedom Tower and in front of 7 World Center, the sleek tower designed by David Childs of Skidmore, Owings & Merrill for Silverstein Properties to replace the former skyscraper it owned that was destroyed in the terrorist attacks. 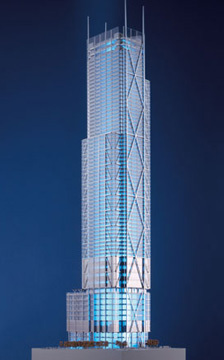 Mr. Silverstein picked Lord Norman Foster (see The City Review article on the architect's new Hearst Tower), Lord Richard Rogers and Fumihiko Maki to design his three towers. 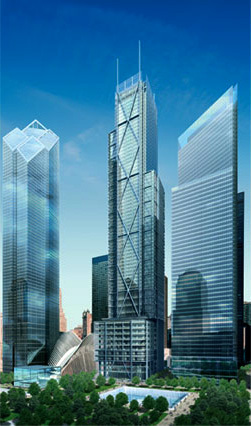 Lord Norman Foster's "Tower 2" is the northernmost of Silverstein's three towers. It is shown from the southwest, left, and from the east, right. 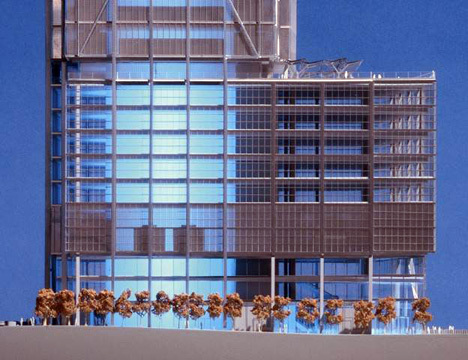 Foster's tower is visually bundled into four sections with deep indentations in the middle of each of its four principal facades and each blue-tinted-glass facade is vertically divided with six light-colored stringcourses. The overall effect is clean, neat, and handsome and conservative, especially given the fact that Foster had submitted a twisting and "kissing" plan for the rebuilding of the World Trade Center that was very high-tech and quite popular with many critics. The slant of Foster's tower recalls a similar slant on a highly visible but much shorter skyscraper in Chicago. Foster's design is much better than the Chicago tower because it breaks down into four diamond shapes that comprise the overall slanted top. The tallest diamond, however, has an open top at its northeastern pinnacle and this unfortunately mars the design considerably and hopefully can be correctly by filling it in with a continuation of the glass facades. As it is, it jars and is not whimsical. The tower has a low-rise bustle on its eastern side, presumably to accommodate large trading floors. It has a flat roof that would probably have been enhanced somewhat if it had a slanted roof also. It should be remembered that Libeskind's winning master plan indicated that low-rise structures at Ground Zero would have sharply raked angles somewhat reminiscent of his fabulous design of windows for a museum in Berlin. The sheer verticality of Foster's rather slender tower is likely to be awesome. It will have 2.3 million square feet of office space on 50 floors, four trading floors, a 65-foot-high lobby and 143,000 square feet of retail space. Tower 4, the middle of the three Silverstein towers on the east side of the Ground Zero site, has been designed by Lord Richard Rogers. It is separated from Foster's Tower 2 by Santiago Calatrava's transportation center building, which is dwarfed by the two towers. Tower 4 will be 1,155 feet high and have four spires at its corners rising above the tower's screened roof. The asymmetrical tower will be distinguished by the diagonal bracing on much of its facades and the overall design is somewhat similar, but fussier, than the architect's design for the new New York Times Tower on the east side of Eighth Avenue between 40th and 41st Streets that is being built by Forest City Rattner and is nearing completion now. This tower will have 2.1 million square feet of offices on 54 floors, five trading floors and 133,000 square feet of retail space. Tower 3 sets its tower on the east side of its base, which opens up to an extent views from the south of Foster's Tower 2 as well as views from the north of Maki's Tower 4. Much of Rogers's Tower 4 's facades have diagonal steel bracing on the exterior, one of his stylistic signatures. 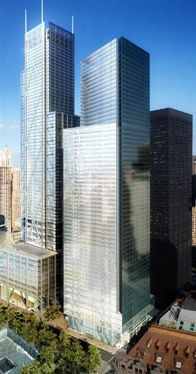 Fumihiko Maki's Tower 4 is the simplest of the three new towers and bears a strong resemblance to Edward Larrabee Barnes 599 Lexington Avenue tower at 53rd Street that was built by Boston Properties in its shearing away of one of its top's corners. 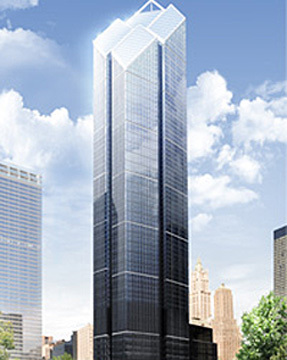 The silvery glass facades of Maki's Tower 4 will complement David Child's 7 World Trade Center tower for Silverstein Properties that was recently completed, but has little in common with the other two new towers. It will be 947 feet high and have 1.8 million square feet of offices on 53 floors and fives floors of retail. The building's plan at the base is trapezoidal and its top is a parallelogram. It will have a restaurant at its base overlooking the plaza and its sunken fountain memorials. 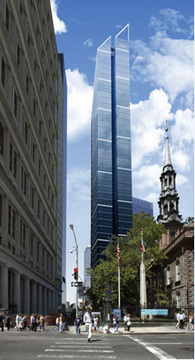 In his review of the new towers in the September 8, 2006 edition of The New York Sun, James Gardner correctly notes that none of the new designs are "outstanding," adding that "This is understandable, given that their job is to play second, third and fourth fiddle to the Freedom Tower, which will eventually cow them into subservience." While the Freedom Tower will be the tallest at Ground Zero, especially when including its spire, it does not really soar that much above the other towers, all of which are very tall by any standards. When completed, Ground Zero is going to be a very vertiginous venue. The three new designs are not going to get lost in the Lower Manhattan orchestral oeuvre of buildings. Minoru Yamasaki's Twin Towers were virtually identical, except for the large antenna on the north tower. As such they had a remarkable resonance, especially because of their gleaming, stainless steel facades. While many people pointed out that they seriously impacted the downtown office space market when they were erected, they created greater visual havoc with the city's skyline as they were not centered but way off to the Hudson River site, a problem somewhat corrected by the subsequent development by Olympia & York of the World Financial Center, four major towers all designed by Cesar Pelli with very similar facades but different crowns. The World Financial Center and the many residential buildings at Battery Park City widened Lower Manhattan and therefore readjusted the "tilt" caused by the World Trade Center. The fact that the three new towers have nothing in common with one another is unfortunate and wrong and is likely to make Ground Zero a little like Third Avenue, which has no cohesive style. Chaos and odd juxtapositions are New York City characteristics. The initial plans by Philip Johnson and John Burgee for several new towers at the base of Times Square at 42nd Street called for a unified design, a plan that was subsequently changed. Times Square now is a cacophonous environmental visually but that has more to do with its mandated signage than its architectural legacy. 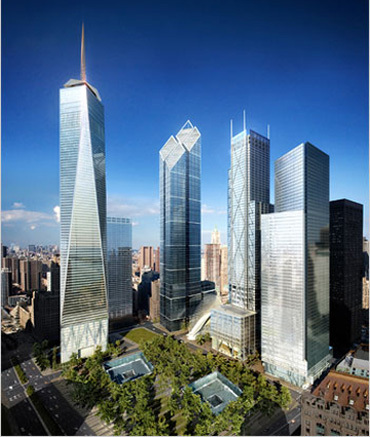 Libeskind envisioned that the towers at Ground Zero would be unequal and recently was quoted as stating that he likes the fact that they are very different. An argument can be made that individuality is very much in keeping with the New York temperament, but that does overlook the refinement of the Rockefeller Center ensemble and the original Terminal City built around Grand Central Terminal, both exemplars of urban design and planning and very good architecture. The problem with attempting a unified stylistic approach to all the towers at Ground Zero, which the lead editorial in the September 9, 2006 edition of The New York Post, termed "the pitiful pit," is that while it may be more meaningful given the special nature of the site it runs the risk of less than great architecture on a very large scale as opposed to accommodating a disappointment, or two. At this point, given the design fiasco so far, it is too late in the game, from the viewpoint of the city's pscyhe, to start all over again, even though that is not a bad idea. "The party's on," as one general to remark in the Allies's disastrous decision in World War II to break through German lines to capture a lot of bridges. It still would make sense to try to tie the buildings together stylistically, perhaps at their bases. In his September 8, 2006 article in The New York Times, David W. Dunlap observed that "Courtlandt Street will be kept open between Towers 3 and 4," adding that "The Port Authority had proposed building a shopping arcade that would have lined the buldings' bases, but city officials objected to the loss of an open,public corridor between the memorial and the rest of Lower Manhattan." None of the three new buildings are exceptional. Foster's probably has the nicest curtain wall, but its cut-off slanted roof and very thin proportions are not graceful. Rogers's tower is a bit like his new tower for The New York Times on Eighth Avenue at 40th Street but much fussier. Maki's tower might be well at home in Dallas, or Miami, but is very, very bland and uninteresting. Describing the three new designs as "conservative and coolly corporate, they could be imagined in just about any Western capital," Nicolai Ouroussoff wrote in the September 11,2006 edition of The New York Times," adding that "for those who cling to the idea that the sites haunting history demands a leap of imagination, the towers illustrate how low our expectations have sunk since the city first resolved to rebuild there in a surge of determination just weeks after 9/11."